Impressions: "Popcorn, Get Your Popcorn Here"
This is very cute. I have made a card almost exactly like it before. It is soooo cute. I like this set a lot. I have never used the gumball machine for anything though. I unmounted it and that help with the popcorn alignment, especially if it is trimmed closely. Hey - I was just thinking of this set earlier this week when I seen a huge display of popcorn related items at Cost Plus World Market! SO cute! These are adorable!! I love liquid applique! so very cute. Love the popcorn! Love these colors together Rochelle! Your special gifts ideas are always in inspiration to me. Thanks for sharing your talent with us! I love your cards! 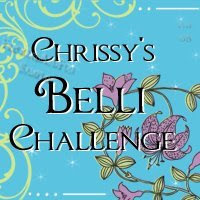 I have been checking out your blog--GREAT cards! I'll definitely be back to peek at what you are up to! Have a great day! 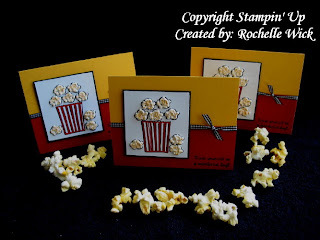 Very cute little popcorn cards! I love the touch of applique to the popcorn, really neat! This is such an amazing creative set. Great cards, popcorn covers and candy covers. There are going to be some very happy teachers out there. I love your work! This is so so so adorable!! Gorgeous work, I love the "popcorn".